"Srila Rupa Gosvami, after consulting various scriptures, has enumerated the transcendental qualities of the Lord as follows: (1) beautiful features of the entire body: (2) marked with all auspicious characteristics; (3) extremely pleasing: (4) effulgent; (5) strong; (6) ever-youthful; (7) wonderful linguist; (8) truthful; (9) talks pleasingly; (10) fluent; (11) highly learned: (12) highly intelligent; (13) a genius; (14) artistic; (15) extremely clever; (16) expert; (17) grateful; (18) firmly determined; (19) an expert judge of time and circumstances; (20) sees and speaks on the authority of Vedas, or scriptures; (21) pure; (22) self-controlled; (23) steadfast; (24) forbearing; (25) forgiving; (26) grave; (27) self-satisfied; (28) possessing equilibrium; (29) magnanimous; (30) religious: (3l) heroic; (32) compassionate: (33) respectful: (34) gentle; (35) liberal; (36) shy; (37) the protector of surrendered souls; (38) happy; (39) the well-wisher of devotees; (40) controlled by love; (4l) all-auspicious; (42) most powerful: (43) all-famous: (44) popular: (45) partial to devotees: (46) very attractive to all women; (47) all-worshipable; (48) all-opulent; (49) all-honorable; (50) the supreme controller. The Supreme Personality of Godhead has all these fifty transcendental qualities in fullness as deep as the ocean. In other words, the extent of His qualities is inconceivable. Besides these, there are other transcendental qualities which are described by Lord Siva to Parvati in the Padma Purana, and in the First Canto of Srimad-Bhagavatam in connection with a conversation between the deity of the earth and the King of religion, Yamaraja. It is said therein, "Persons who are desirous of becoming great personalities must be decorated with the following qualities: truthfulness, cleanliness, mercy, perseverance, renunciation, peacefulness, simplicity, control of the senses, equilibrium of the mind, austerity, equality, forbearance, placidity, learning, knowledge, detachment, opulence, chivalry, influence, strength, memory, independence, tactfulness, luster, patience, kindheartedness, ingenuity, gentility, mannerliness, determination, perfection in all knowledge, proper execution, possession of all objects of enjoyment, gravity, steadiness, faithfulness, fame, respectfulness and lack of false egotism.'' Persons who are desiring to become great souls cannot be without any of the above qualities, so we can know for certain that these qualities are found in Lord Krsna, the supreme soul. Besides all of the above-mentioned fifty qualities, Lord Krsna possesses five more, which are sometimes partially manifested in the persons of Lord Brahma or Lord Siva. These transcendental qualities are as follows: (51) changeless; (52) all-cognizant; (53) ever-fresh; (54) sac-cid-ananda (possessing an eternal blissful body); (55) possessing all mystic perfections. 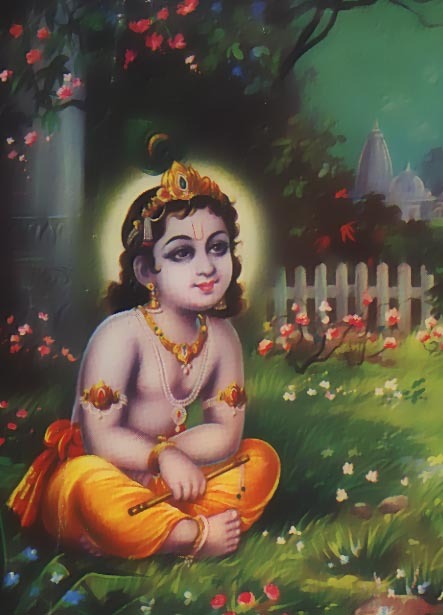 Krsna also possesses five other qualities, which are manifest in the body of Narayana, and they are listed as follows: (56) He has inconceivable potency. (57) Uncountable universes generate from His body. (58) He is the original source of all incarnations. (59) He is the giver of salvation to the enemies whom He kills. (60) He is the attractor of liberated souls. All these transcendental qualities are manifest wonderfully in the personal feature of Lord Krsna. Besides these sixty transcendental qualities, Krsna has four more, which are not manifest even in the Narayana form of Godhead, what to speak of the demigods or living entities. They are as follows: (61) He is the performer of wonderful varieties of pastimes (especially His childhood pastimes). (62) He is surrounded by devotees endowed with wonderful love of Godhead. (63) He can attract all living entities all over the universes by playing on His flute. (64) He has a wonderful excellence of beauty which cannot be rivaled anywhere in the creation. Adding to the list these four exceptional qualities of Krsna, it is to be understood that the aggregate number of qualities of Krsna is sixty-four. Srila Rupa Gosvami has attempted to give evidences from various scriptures about all sixty-four qualities present in the person of the Supreme Lord."